Aluminum wiring is potentially disastrous! Do you have aluminum wire in your home? Here in the Denver Metro area, most of the homes built before 1972 do and need aluminum wiring repairs. Several reasons. But they all have to do with the fact that in the 1960’s there was a shortage of copper and builders went to the much less expensive and much less conductive aluminum. Without going into too much detail, copper is preferable as a wire because it is much more conductive. That means the electrons travel unimpeded and don’t build up electrical “friction.” Aluminum wiring, on the other hand, has decent conductivity, but impedes the electrons and builds heat due to this “electrical friction” or resistance. How bad is aluminum wiring in a house? The U.S. Consumer Product Safety Commission (CPSC) has investigated the issues with aluminum wiring in homes built before 1972. These “other connections” are prevalent in homes built both before and after 1972. The reason there is so many “other connection” types is due to the fact that all of the electrical supplies manufactured after 1972 are copper specific. 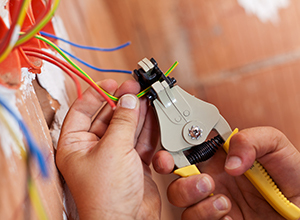 In order to connect aluminum wires to copper specific electrical supplies you have to use what’s known in the industry as an aluminum wiring “pigtail”. These pigtails can become unsafe over time and need to be checked for issues. If you want to eliminate the 5,500% greater chance of an electrical fire in your home, then you need to rewire your home to copper. This can be an expensive proposition, but how much is your safety worth? Especially if an issue arose while you were asleep in bed! These nightmare scenarios are unfortunately common experiences with aluminum wiring. That’s why, if you have aluminum wires in your home, you need to give us a call today and let us inspect your home’s wiring and give you an accurate assessment of any potential aluminum wiring dangers.